Yoshiko Shimada and Soni Kum are two of the most significant contemporary artists working in Japan today engaging with challenging and complex issues surrounding cultural identity and personal and collective memory. Working across the boundaries of art, performativity and activism, they offer thought-provoking and poetic insights into differing aspects of Japan's contested history and contemporary Japanese culture. Trained as a printmaker in the early 1980s, Tokyo-born Yoshiko Shimada has extended her individual and collaborative practice to installation, video and performance. Also born and brought up in Tokyo, Soni Kum who graduated in film and video in 2005, works mainly in performance and film and explores memories and experience from the perspective of a third-generation Korean resident in Japan. 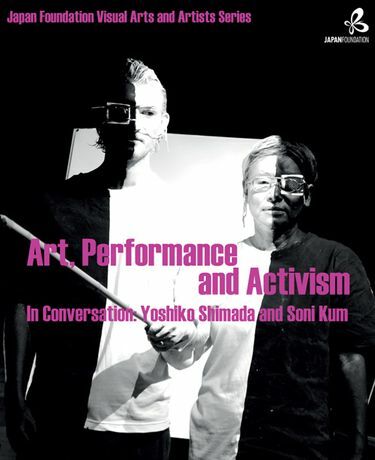 In conjunction with the Pump House Gallery exhibition Art, Performance and Activism featuring the work of Yoshiko Shimada and Soni Kum, the Japan Foundation has invited the exhibition's curators, Professor Fran Lloyd, a Japan Foundation Fellow of Kingston University, London and Professor Rebecca Jennison of Kyoto Seika University in Kyoto, Japan to join the artists in a discussion about their work, their collaborative methods, and their differing experiences and perceptions as women artists based in Japan. This event offers a unique opportunity to hear both artists speak about their work, and also explore broader issues about their practices as women artists/activists and the contemporary art scene. This event is free to attend but booking is essential. To reserve a place, please email your name and the title of the event you would like to attend to event@jpf.org.uk.